British 1960's pop star Dusty Springfield's former home in London is for sale and featured this week at TopTenRealEstateDeals.com. Dusty Springfield’s London home where she lived when she recorded 'Son of a Preacher Man' is for sale. One of the 1960's and '70's most popular British singers was Dusty Springfield. Her former London Art-Deco style home with indoor pool, roof terrace and party room is for sale asking almost $20 million. Dusty could sing it all crossing pop, blues and jazz with hits such as 'Son of a Preacher Man,' 'The Look of Love' and 'I Only Want to Be with You.' She died in 1999 at age 59. Springfield got her start in the music scene in the 1950s and became one of the icons of the Swinging Sixties with her big voice and almost-as-big, peroxide-blonde hairdo. In her career, she had six top-20 singles on the United States Billboard Hot 100 and sixteen on the United Kingdom charts. She is a member of both the U.S. Rock and Roll and U.K. Music Halls of Fame and was honored with the Order of the British Empire in 1999. Springfield lived at the London home when her most famous hit, 'Son of a Preacher Man,' was released in 1968. Dusty’s Art Deco-style house in London’s W8 neighborhood is for sale through the Savills Kensington realty company for $19.72 million (£14m). Situated on Aubrey Walk, a highly regarded residential street, the property is the result of combining Springfield’s former apartment with another terraced home to create one unique broad-fronted house. Encompassing 7,200 square feet and arranged over five levels, bedrooms include several suites while the top floor is devoted to a master with a sitting room, dressing room, bed and bathroom and opens to a south-facing roof terrace with long-reaching views. The ground floor is the largest of the five floors and incorporates a big entrance hall, dining room, living room and light-filled kitchen/breakfast/family room which leads out onto the garden. The bottom floor has a fitness and leisure complex with 35-foot swimming pool, sauna, gym and party room. The property is well positioned for local transportation links including the Holland Park and Notting Hill Gate tube stations just a short walk from the property. The boutiques, restaurants and bars of Notting Hill Gate and Kensington High Street are within close reach. 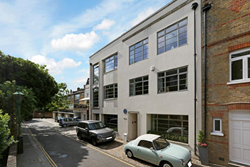 Rock-era singer/producer Dusty Springfield’s former London Art Deco home from 1968 to 1972 is for sale, priced at $19.72 million (£14m). The listing agent is Kit Allen of Savills Kensington realty company in London.